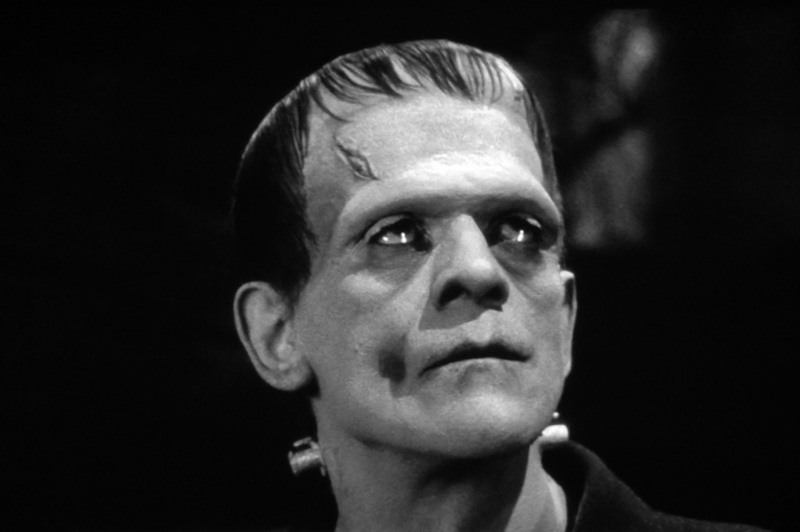 I don’t remember when I first saw the 1931 film Frankenstein, directed by James Whale. I also can’t remember a time when I didn’t know the basic story of Frankenstein. I don’t know for sure what my first exposure was to the myth. I remember watching more than one of the Universal Studios Frankenstein movies with my mom when I was young. I remember one particular time watching it with my mom and my sister, my sister was maybe four or five years old and kept asking questions. I was getting impatient, and Mom told me I had been exactly the same way when I had been my sister’s age. It was obvious in all of the Universal films that the monster simply didn’t understand much of anything about the world. He was big and scary-looking. Nearly everyone who met him reacted with fear, usually leading to violence. He didn’t understand what was expected of him. He didn’t know how to be loved. He didn’t know how to communicate his hopes, wishes, or fears. The one person who should have taught him how to do these things, who should have have taken responsibility for him, failed utterly. In fact, Dr. Frankenstein’s irresponsible and often cowardly behavior kept making the situation worse. With the help of another scientist, Dr. Frankenstein drugs the monster, then leaves the monster with the scientist to let him be dissected, and goes off to get married as if murdering another person is no big deal. Of course the monster escapes, has the encounter with the little girl who attempts to befriend him. Not understanding how fragile a small human is, the monster kills her, leading to the angry mob showing up at the home of Dr. Frankenstein’s father, the Baron. Dr. Frankenstein actually tries to lead the mob in hunting down and killing the monster, but somehow gets separated, then captured by the monster, and eventually when the monster is trapped at the top of a windmill which the mob is setting on fire, Dr. Frankenstein is hurled off the building by the monster. 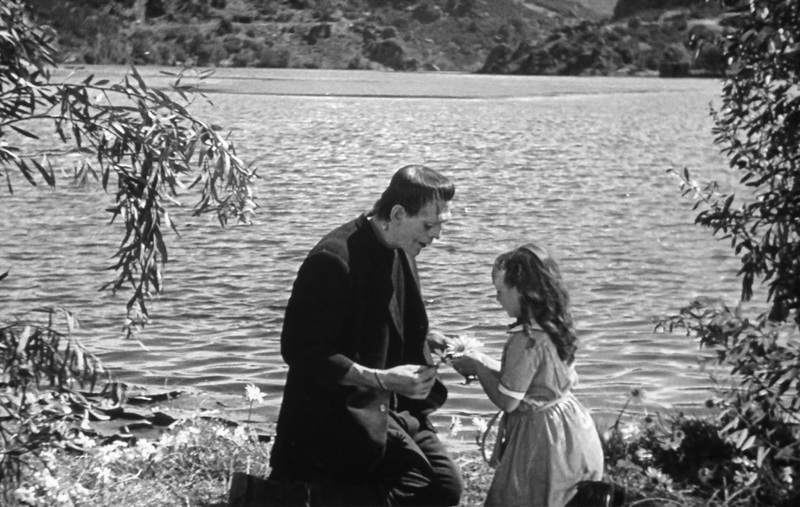 The theme of the monster’s desire to be loved and understood was quite strong in the 1931 Frankenstein, but it was even more powerfully developed in the sequel, also directed by James Whale, and featuring most of the same cast, The Bride of Frankenstein filmed in 1935. In the sequel, Dr. Frankenstein and the monster have both miraculously survived the ending of the first film, though Dr. Frankenstein doesn’t know the monster lives. Dr. Frankenstein’s old mentor, Dr. Pretorius, shows up and tries to convince Frankenstein to take up his pursuit of the secrets of immortality again, while the monster resumes his search for acceptance. The monster rescues a young shepherdess from drowning, but is shot and driven away by frightened hunters. He’s captured by a mob, chained and locked in a dungeon, and somehow escapes. He befriends a blind hermit, until some more hunters wander by, and attack the monster, in the process setting the hermit’s cottage on fire. Eventually the monster finds Pretorius. By this time the monster has learned to speak very crudely, and they come to an understanding. Pretorius goes to Dr. Frankenstein once again, and when he fails to convince him to help create a bride for the monster, so the monster will no longer be alone, he has the monster kidnap Frankenstein’s young wife. 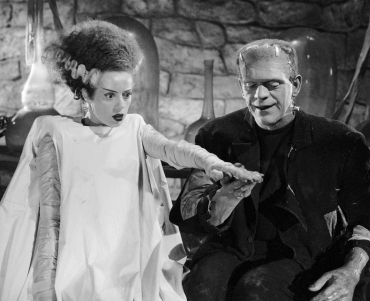 Elsa Lancaster as the bride and Boris Karloff as the monster. It is the monster who makes the moral choice to try to end his own rampages, not Dr. Frankenstein. The real sin of Dr. Frankenstein isn’t that he explored knowledge that men or not meant to know, nor that he tried to set himself equal with god. This is clear even in the title of Mary Shelley’s original novel, Frankenstein, or the Modern Prometheus. In greek legend Prometheus is a titan (the species of divine beings who were the forefathers of the gods of Olympus) who give fire to mortals, contrary to the wishes of the other gods. This gives mortals more power over creation than the gods wanted them to have, which leads to Prometheus being imprisoned for eternity on a mountain top where an eagle comes each day to tear out his liver and eat it. Prometheus isn’t a legend of a mortal hero stealing fire from the gods, it is the story of a god giving mortals something they don’t understand how to control. If Dr. Frankenstein is Prometheus, then his doom is because he gave life and more importantly sentience (not to mention superhuman strength and an ability to recover from almost any injury) to a creature without teaching that creature how to live among the rest of creation. It was many years later before I learned that James Whale, the director of the two original Universal Frankenstein movies was an openly gay man in the 1930s. Which was an extremely rare and unusual thing to be. When people have suggested that Frankenstein and Bride of Frankenstein were metaphors or allegories for the gay experience, his longtime partner, David Lewis, who was a prominent film producer throughout the 40s and 50s, insisted that if so, it was subconscious, because Whale had been an artist, not a gay artist. If, by the way, you’ve never seen the movie Gods and Monsters in which Ian McKellan protrays Whale during the last weeks of his life, after he had suffered a series of strokes, you really should. It’s a deeply moving story. Anyway, whether intentional or not, those themes definitely resonated in this queer kid’s soul, long before I know I was gay, I had been reminded again and again that I didn’t fit in. I never seemed to like the right things. I never quite acted the way others expected me to. And everything I did to try to fit in just seemed to make things worse. After puberty, once I understood what was different about me, the similarities just became more powerful. Church, society, and even my family said that gay people were monsters, doomed to hell. No wonder I continued to sympathize with the poor monster!